ìMorreremos de pÈî is Cruz de Ferro’s first album, with 10 songs sung in portuguese. Recorded and mixed by Arlindo Cardoso (Low Torque; TÛ Pica; ex-W.A.K.O. ), also worked on the debut EP ìGuerreiros do Metalî (2012), plays all drums on this CD. Edited on december 19 of 2015 by NonNobis Prod., ìMorreremos de pÈî shows the full epicness of Cruz de Ferro with 50 minutes of intense battle cries and harmony solos. 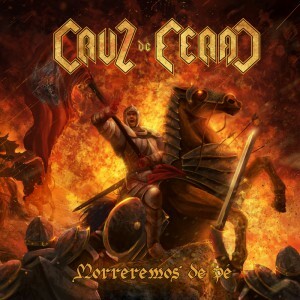 CD cover, by Pedro Sena Lordigan, based on the heroic acts of D. Duarte de Almeida, that holded on to the national flag, even after his hands were cut off. After being awarded „Best Portuguese Band of 2013“ by the readers of Loud! Magazine, this album establishes the place of Cruz de Ferro as one the pillars in Heavy Metal sung in portuguese. ìGuerreiros do Metalî is the lauching EP from Cruz de Ferro, with five songs singed entirely in Portuguese. The band started in the beginning of 2010, in Torres Novas, a small town in the center of Portugal. The project was conceived by Ricardo Pombo, vocalist/guitarist and main composer. In August 2012 Cruz de Ferro entered Southern Studios to record the five songs included on ìGuerreiros do Metalî EP. Recorded and mastered by Arlindo Cardoso (ex-W.A.K.O. ), which also composed and played drums on this recording. This CD as two special voice guests: Nelson Santos and Vitor Pinheiro. Cover artwork was made by IrondoomDesign, from Augusto Peixoto. Cruz de Ferro released a video for the song ìDefensoresî, shot at Grutas de Lapas. Please share on Facebook. Thank you.